Once you turn onto Castle Hill’s tree-lined driveway from legendary Ocean Drive and pass our private marina, you enter another world. Yet our secluded property is merely minutes from the action of downtown Newport, also known as the City by the Sea. Few coastal towns offer as much to do as our city: Guests can tour historic mansions, go shopping on Thames Street, visit the International Tennis Hall of Fame, ferry out to the Rose Island Lighthouse, or view art at the Newport Art Museum. Visit some of our favorite nearby Newport, RI attractions when you stay at Castle Hill Inn. From taking a private charter out on Narragansett Bay to touring famous Newport mansions, there are a variety of Newport, RI activities to enjoy in every season when you stay with Castle Hill Inn. What was once considered a summer destination has become a year round coastal haven for those looking to practice the art of relaxation or those looking for adventure out on the water or on land. Review some of our favorite things to do in Newport and book your seaside stay in Rhode Island today. With over 800,000 visitors a year, the legendary Newport mansions are one of Rhode Island's top attractions. The Preservation Society of Newport County operates several different homes. Of these, the most popular mansions are The Breakers, Marble House, The Elms, and Rosecliff. Learn more about touring the mansions here. Set sail in Newport, RI, often referred to as "Sailing Capital of the World." On a typical sail cruise or charter, guests can gaze upon Newport's legendary mansions and lighthouses. 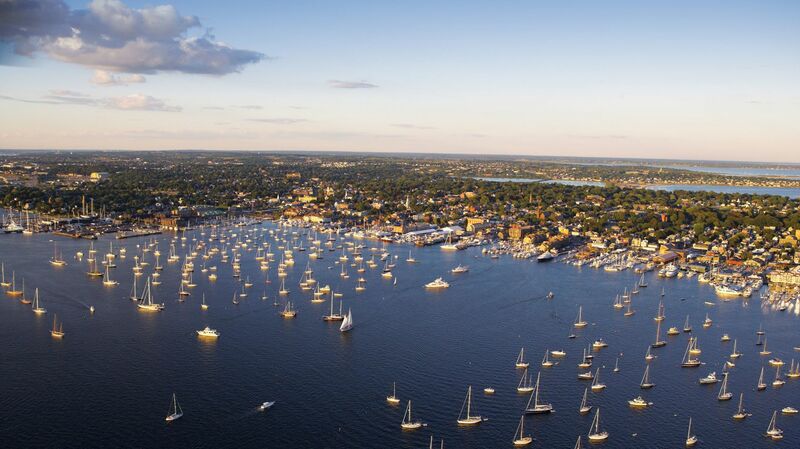 The sweeping views of Newport and Jamestown are the perfect backdrop for sailing cruises and charters. Narragansett Bay delightfully opens to the Atlantic Ocean and offers a rare retreat for fishing, kayaking, and stand up paddle boarding. Small, protected inlets along the rocky shoreline provide exquisite diving and snorkeling opportunities. Surfing has also become a mainstay in Newport culture year round, with mighty waves coming from the tropical storm season 100 miles off shore in the late summer and early fall. Take in the scenery from golf courses with water views offering world-class vistas and athletic challenges. Castle Hill is located close to a number of renowned clubs, each with its own unique setting and challenging holes. Although Castle Hill Inn offers private beach access to Grace Kelly Beach and Castle Hill Beach, Newport offers a variety of other nearby beaches worth exploring. From Easton's Beach along the famed Cliff Walk to relaxing Gooseberry, there is something for everyone, whether you have your heart set on sunbathing or having a swim. Consider exploring one of the wine world’s best-kept secrets: Aquidneck Island, one of the nation’s most desirable areas for vineyard production. Ample farmland and a moderate micro-climate allow for a long growing season that produces complex flavors in our wines. Enjoy expertly led tours of our local wineries, Newport Vineyards and Sakonnet Vineyards. Explore nearby attractions in Newport, please visit Discover Newport and The Preservation Society of Newport County and make the most of your stay at this iconic coastal escape, an ideal place to visit in every season.